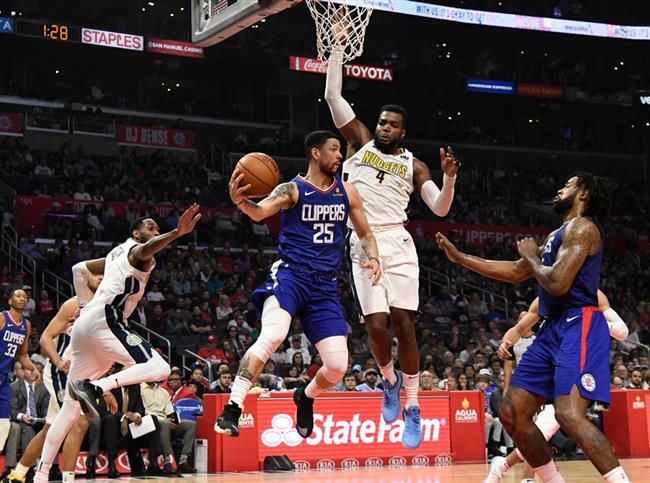 Will Barton scored 31 points as the Denver Nuggets kept their playoffs hopes alive with a 134-115 victory over the Los Angeles Clippers on Saturday. Los Angeles Clippers guard Austin Rivers hangs in the air as he passes around Denver Nuggets forward Paul Millsap during the first half of their NBA match at Staples Center in Los Angeles on Saturday. The Nuggets won 134-115 to keep their playoff hopes alive while eliminating the Clippers from playoff contention. Nikola Jokic finished with 23 points, 11 rebounds and 11 assists as the Nuggets won their fifth straight to move into a tie with the Minnesota Timberwolves for eighth place in the NBA Western Conference with two games to play. Both teams are 45-35. “At this time of the year, it’s all about finding a way to get wins,” Nuggets coach Mike Malone said. With the offense leading the way some nights and the defense on others, the Nuggets have regained control of their playoff destiny. They will reach the postseason if they win their last two NBA games. The Nuggets finish the regular season at home against Portland tomorrow. The stage is now set for the Nuggets’ season-ending game against the Timberwolves in Minneapolis on Wednesday. Minnesota, which holds the tiebreaker over the Nuggets, hosts Memphis tomorrow. Lou Williams scored 24 points for the Clippers while DeAndre Jordan had 16 points and 17 rebounds. The loss eliminated the struggling Clippers (42-38) from the postseason race as they lost for the fourth time in the past five games. The loss ends a string of six straight postseason appearances for the Clippers. “I don’t think I have been more proud of a group, maybe ever, than I have been of this group,” said Clippers coach Doc Rivers. Elsewhere, Russell Westbrook and Paul George combined for 48 points as the Oklahoma City Thunder pulled away in the fourth quarter to beat the Houston Rockets 108-102. Oklahoma City was behind by one point with seven minutes to go before going on an 11-0 burst. The hosts Rockets scored five straight points with less than a minute left to get within five, but George made two free throws to clinch the win and snap Houston’s 20-game home win streak. The Thunder (46-34) are battling with a number of teams for the final playoff berths in the Western Conference. Carmelo Anthony tallied 22 points for the Thunder, including some clutch 3-pointers. James Harden had 26 and Chris Paul chipped in 17 points for the Rockets in the loss. In Oakland, Anthony Davis carried the load down the stretch en route to 34 points as the New Orleans Pelicans snapped a 10-game losing streak to Golden State with a 126-120 win over the Warriors.